"The term "Renaissance Man" is often bandied about, but there are very few men who truly warrant that description. Rev. Dr. Eugene Sawicki is among them." So begins Father Sawicki's bio on the Mercy College web site. The profile goes on to describe the 7 advanced degrees he earned after his 1970 graduation, his service in the New York State National Guard and the FDNY and his licensure as a Registered Nurse. 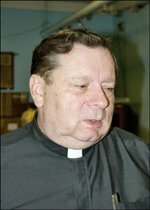 Father Sawicki wears his accomplishments lightly, moving among us with warmth and humor, using his knowledge and experience to help, encourage and inspire. With his Lithuanian and Polish ancestry, his working class roots and his quiet erudition, he stands in the tradition of Father Šeštokas, Our Lady of Vilnius' founding worker/priest. He is the embodiment of our tradition and the heart of our parish.